Carla from my gym is very involved with Nelson Quilters' Guild, and they had their biennial (I think) show this weekend at Nelson Girls College. 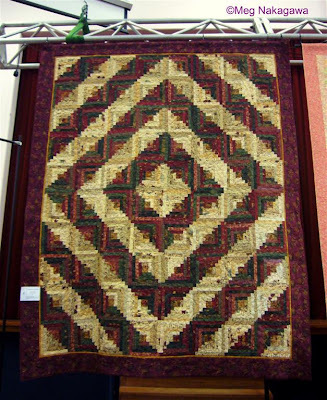 Boy, talk about labor-intensive work; I felt a warm and fuzzy kindred spirit with the quilters, but there were so many people coming to the show that I must admit I was a little envious. I doubt a weaving show can attract that kind of crowd in Nelson. To me, the patchwork on the front is bad enough, but the quilting in those elegant curvy lines is just mind-boggling. They provided white gloves so we are allowed to touch them and turn them over, and were also allowed to photograph. Here is one of Carla's, and one of my favorite in the show. I had seen this before when she finished it, spread out on the gym floor, but it was so much more impressive to see this hung so I can stand back and admire it. I'm not confident the colors are true on your monitor, but the values of the pieces were carefully studied and positioned, making this an understated but stunning piece. But, no, this is one craft I'm not tempted to try; I've done one single-bed blanket with little red and green squares the summer before I started college, and I was in tears, with Mom, sister, and even Dad helping me the day before I returned to Minnesota. It's hard work!! Nope, Nothing about Weaving in This Post. Again! For Whom Do I Weave? Coffee Sleeves, Ladies and Gentlemen! !